Our organization has been singing the praises of Mellisa Nielsen since our annual benefit gala this past September. Mellisa was charismatic and charming and used her expertise to increase bids and fundraising throughout the evening. Mellisa was well versed in our organization and involved in key planning of auction and fundraising elements to ensure we could maximize our efforts there. We felt she was personally invested in our goals to raise to certain levels and was flexible and proactive in those regards. Mellisa inspired with her class, poise, and approachable nature. We're confident her expert skill contributed us to a record-breaking evening. We can't wait to work with her again. Mellisa and her Charity Angels team are beyond fantastic! First they professionally guided us through the process and helped us create the optimum auction packages and fund-a-need format / visuals. Then, during the auction Mellisa has an amazing sense of the audience and creatively urges them to immense generosity. The results are nothing short of miraculous! The first Imagine Ball she hit a home run, the second a grand slam! Mellisa's presence lit up the ballroom. The research she did on our Medical Center prior to our Gala showed the minute she stepped on stage to lead our Fund-A-Need. Mellisa is a consummate professional who went above and beyond to ensure the needs of our organization are not only, met but exceeded. We recommend Mellisa 110%! Success in fundraising is not only measured by how much you raise at an event but how you impact those who attend. Mellisa and her team take the time to understand who The First Tee of Los Angeles is and how we impact underserved youth. This translates to her team and how they approach attendees. Everyone leaves the Angel’s capable hands knowing that they are doing good and feel they have joined others to create meaningful change in our community. Mellisa does deliver on raising significant funds for us but it is her approach that keeps donors coming back. A HUGE thank you for a job incredibly well done this past Saturday night. I truly thought you were amazing. You were so well prepared, you are so articulate and professional - you were PERFECT for our crowd. For the last two years, Mellisa Nielsen has been an amazing auctioneer for our annual gala fundraiser. She brings such exuberance and enthusiasm during the live pledge appeal and auction, which in turn engages and motivates our guests to raise their paddles and donate more money to our cause! Mellisa is a pleasure to work with! Mellisa came on board for my ‘Tea with Victoria Summer’ event held at the British Consulate. She is extremely knowledgeable and professional and was an enormous asset to our team. Mellisa was an invaluable resource. When it came to the fundraiser, she was able to take the lead, keep the audience interested and ultimately helped us make our donation goals. I look forward to working with Mellisa again. Mellisa Nielsen is hands down the best Auctioneer I’ve ever worked with or experienced. She takes all the time necessary to understand the organization she’s working with and it pays off greatly. The first time I used Mellisa for a charity event she increased donations 50% over the prior year. She’s professional, understands timing and knows how to get the most out of a room!!! Working with Mellisa is both enjoyable and rewarding for your organization. President, The Maria Group Inc.
Mellisa Nielsen and her team personify the art and economics of auctioneering -- delivering a kind of high-wire performance that captures hearts and minds to raise seriously noteworthy revenues. Everyone came away exhilarated. Mellisa is our best-ever event investment decision. Thank you so much for the amazing job you did at our Gala last month. We were absolutely thrilled and the event was a huge success. You led the live auction masterfully and we were very pleased with the results. You and your team were wonderful and contributed greatly to the smooth flow of the evening and certainly enhanced the entire event. The level of professionalism, energy and sense-of-occasion that Mellisa Nielsen brought to our event was a whole order of magnitude higher than we dreamed. Mellisa Nielsen and her team helped us choreograph every detail of our benefit to build an amazing auction fever. We hit fundraising home runs all night. Our donors and guests never had so much fun donating more money! If only there were more Mellisa’s to expertly enhance all other phases of life. Thanks to you, we surpassed our fundraising goals and are still getting rave reviews for the beautiful afternoon you helped us create. Mellisa and her team encourage bidders in such a way that they feel privileged to be part of the event. We are forever fans. Mellisa Nielsen and her magnificent team work their magic for our auction every year. Mellisa makes it look easy (it is not) to raise much more money than we hope. Mellisa Nielsen is hands-down our best investment to ensure a brilliant event - they are indispensable and more than pay for themselves. We just booked next year. You made the evening! Your professionalism, demeanor, sincerity, beauty and warm personality took the Semper Fi Fund Social to a whole new level. EVERYONE could not have been more complimentary. Any words of advice you might have for us in terms of further improving the event and end results next year would be welcome and appreciated. I would sincerely hope that you might consider helping us again in 2016. On behalf of all of us involved this year, and more importantly, all the Marines who will benefit from the help given them from the Semper Fi Fund, please accept our sincere appreciation. Thank you again for your support yesterday and for the amazing work of the Charity Angels! The day would not have been such a success without your outstanding role as our auctioneer. You have an energy and excitement that is infectious, and it obviously engaged our guests as well. We have incorporated Mellisa’s services into our Sponsorship Opportunities. Every year it is one of our first categories sold! Donors love the fact their donation is an investment, as their fee comes back tenfold! Mellisa’s honesty, integrity, invaluable advise and support were vital to our success.. Mellisa raised more money that we had even thought possible with her talented auctioneering. Mellisa doubled our previous year’s fundraising goal. Mellisa will always play a major role in our fundraising events and have already booked her for our Gala and Golf Tournament in 2016. Mellisa Nielsen and her team have revolutionized how we collect donations at our fundraisers. Mellisa is a pleasure to work with and is a great resource for ways to raise money in creative and interactive ways that the donors enjoy. I have recommended Mellisa and her sister company Charity Angels to other non-profit organizations and they have proven themselves to be a must have for any fundraising event. You played an instrumental role in making the Childhelp Hollywood Heroes event a huge success both financially and from an experiential standpoint. Your professionalism, enthusiasm and dedication to the cause was beyond what we could have hoped and look forward to working with you again on next year's event. Mellisa has been working with NextStep for over 9 years and is not only a wonderful person but an extraordinary Charity Auctioneer! Why? Because she truly cares about making a difference and helping the charity. 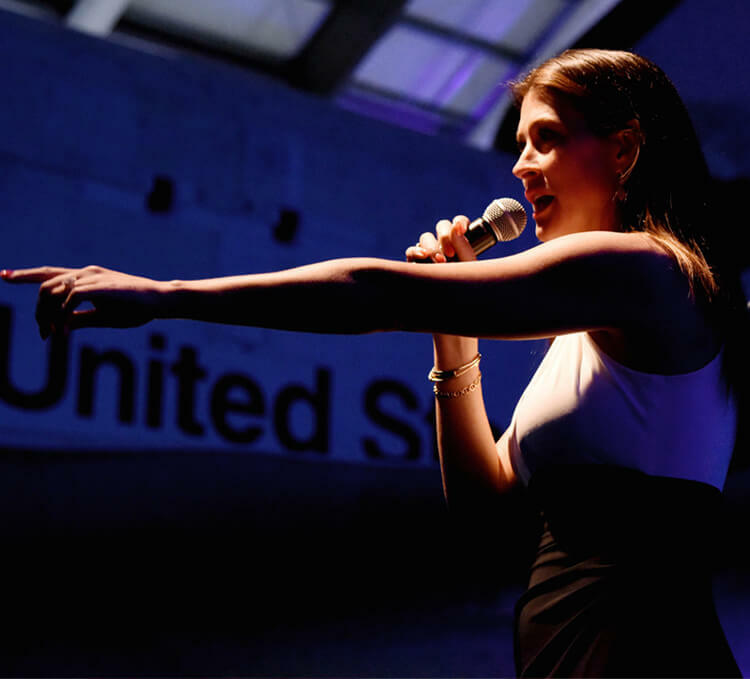 During the auction, she not only captivates and entertains the crowd with her stage presence and humor, but also makes bidders feel grateful to be a part of the event while keeping up excitement and enthusiasm throughout the auction and live ask. She comes prepared and is extremely creative and finds ingenious ways of keeping bidders engaged and spending money. Auctions can be dull and awkward but Mellisa makes them FUN! Working with Mellisa has drastically increased the success of our benefits and therefore enabled us to help more individuals living with paralysis. She is an invaluable resource for any organization looking to hold a live auction and live ask. Don't even think of hiring anyone else, you won't regret it! I can’t thank you enough for joining our fundraising team and flying across the country last minute to lead our annual auction. Our guests can’t stop talking about your stellar performance that more than doubled our fundraising expectations! I think it goes without saying our team would like to secure you for 2018!